Chic, confident and ultra-stylish, this striking diamond ring is sure to grab her attention! 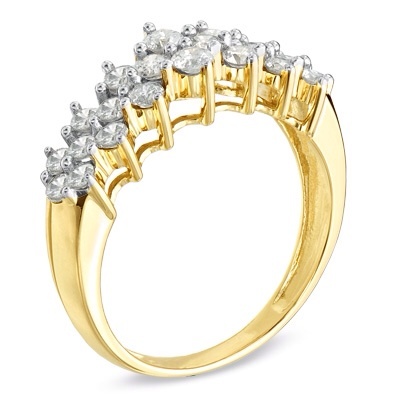 Crafted in warm and elegant 10K gold, this ring features 1 ct. of glittering round diamonds arranged in a horizontal cluster across the band. Polished to a brilliant shine, it's a lovely look for the right or left hand. PRODUCT SPECIFICATIONS Stone Type	Diamond Stone Shape	Round Diamond Total Weight (CT. T.W.) 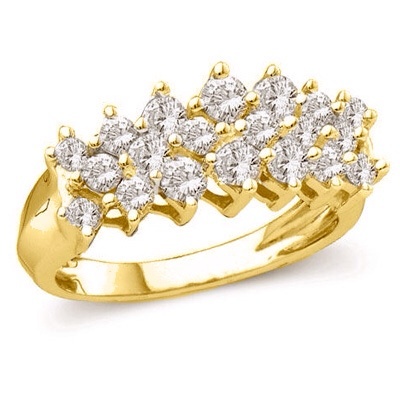 1 Diamond Color	I - J Stone Setting	Shared Prong Gold Karat	10K Standard Ring Size	7 Lifetime Diamond Commitment	Yes Metal Color	Yellow Metal Type	Gold Stone Color	White Diamond carat weights (CT.) represent the approximate total weight (T.W.) of all diamonds in each setting and may vary no more than .07 below the stated weight. Typographic errors are subject to correction. Merchandise enlarged to show detail and may not always be exactly as pictured. Promotions, prices, styles and availability may vary by store and online.